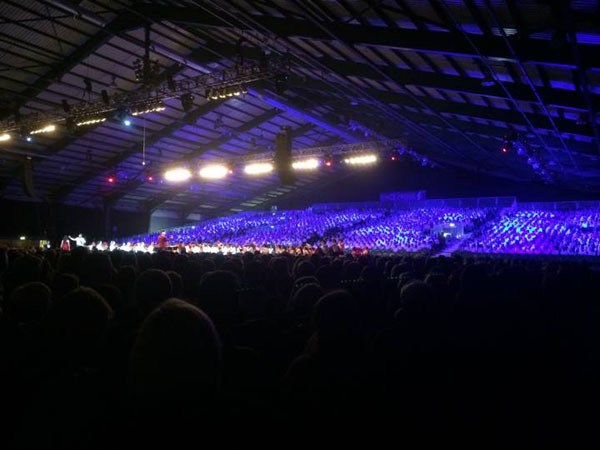 Well done to Rang 5 and Rang 6 who took part in the Peace Proms choir last Sunday evening. It was a spectacular event and a great opportunity to sing in a choir of 2,500 children. along with a full orchestra. Thanks to the parents and families who came along on the night and also to those who provided feedback during the week - and to Romy’s mum for the pic! We have a pine table, about 1m square with a slightly wobbly leg (which is repairable) that we no longer need – if you would like it, it can be removed from the front door from today. We are also getting rid of our video library….remember them? If anyone has a magpie instinct or knows of a happy home they could go to, rather than dump them, please contact me by return email or mention it at the gate in the morning. The Board of Management has recently arranged for additional works to the bathrooms in the classrooms to ensure all classes have access to hot and cold water and to ensure all flushes work well and taps don’t drip etc– again, the cost of this work is over €2,000 and it is through your generous donations that we can get this done in a timely way, so thank you all. If you haven’t yet returned voluntary contributions or tax forms, payments can be made through the school website (www.rmds.ie) – click on the contact button and scroll down to the Easy Payments Plus button. Any problems, call to the office. A reminder to rang 6 parents that the trip to Delphi should be paid for before the midterm break – again go to the website (www.rmds.ie) and click on the school tours button to pay. Lastly, thanks to Colum (Clodagh and Eabha’s dad), Brian (James’ dad) and Gerard (Hugo’s dad) who have enabled us to put the Christmas concerts up on the website – all should be up in the next few days. The School Council will be having a ballot next Tuesday morning to change its name to The RMDS Student Council. All pupils will be able to vote on their way in to school and we will have the result on Wednesday morning. We feel this name better represents the work of the council, so we are hoping that the pupils will agree to the change. We are also organizing the annual World Cup Football competition with Mr. Mulholland at the moment. Finally, high vis jackets are available to all from the office. Call to Eleanor or Mary if you would like one – we have adult sizes as well as kids sizes. Looking forward to a great night tomorrow, Friday - The RMDS Cinema Night! Doors open 18h45, movies starting promptly at 7pm. Final reminder to parents that children must have responsible adult on site throughout. Refreshments will be available in the main hall. We also ask that all children be accompanied home, and not left to leave the school building alone. All classes are working on designing posters to encourage people to save water, using the theme ‘Water: from the cloud to your glass!’ Class teachers have all the information and will pick the best two entries to be sent to Greenschoolsireland.org for the regional and national competition. Talk to your child about their poster ideas, colours and the message. Simple is always best! Closing date is 10th February in school. Regional winners will receive a tablet computer. This is a fun activity for all the children, designed to get them thinking about the journey water takes, and is sponsored by Irish Water. Water is a fascinating substance. Its chemical name is H2O because each molecule of water consists of two hydrogen atoms (H) bonded to one oxygen molecule (O). Hydrogen is the most common element in the universe and is highly explosive. Oxygen is what our lungs take from the air to keep us alive and is highly flammable (burns easily). Isn’t it amazing that when these two fire-loving elements combine, they make water? About 71% of the Earth’s surface is covered in water. 97.5% of our surface water is in the oceans or salty marshes, leaving just 2.5% of our water drinkable. Surprisingly, there is far more water deep in the Earth’s crust than on the surface or in the air. 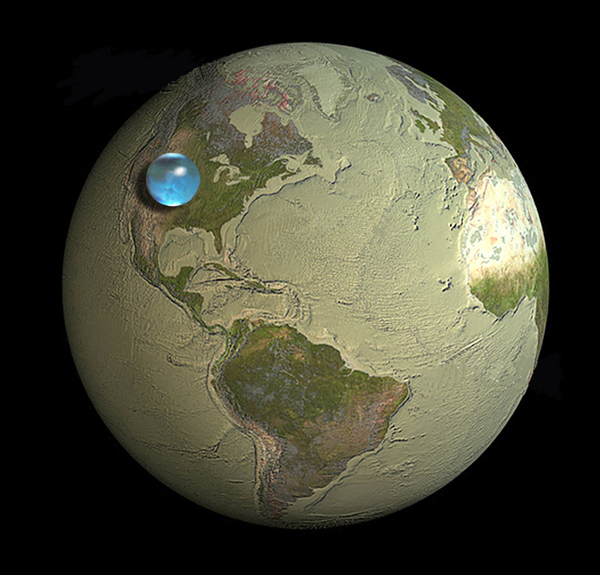 Even still, the total amount of water on the planet adds up to less than one percent (<1%) of the planet’s mass (weight). The picture shows all of the earth’s water gathered into one drop. Also to let you know, all are welcome to a meeting of the local community here in RMDS on Tuesday 10th February at 8.30pm to discuss making Ranelagh a greener village – further information from Ranelagh Arts Centre at 5477775. LAST FEW PLACES childcare@rmds.ie 085-1156506 The Midterm Camp will run from (16th February – 20th February 2014) from 8.30 – 2.00. Childcare 2pm – 6pm (CHILDCARE EXTRA) €70 per child/ €110 for two siblings Application must be returned by the Wednesday 11th February.